for all your channel island ferry needs! 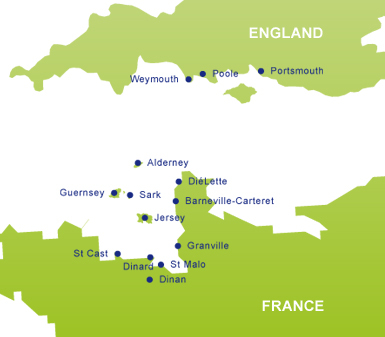 Channel Island Ferry offer ferries across the Channel from Britain to France. Destinations include Alderney, Barneville-Carteret, DiéLette, Dinan, Dinard, Granville Guernsey, Jersey, Poole, Portsmouth, Sark, St Cast, St Malo and Weymouth. With a great selection of special offers and sailings, you are sure to find the cross channel ferry service to suit your needs. Discover the beauty of the Channel Islands today - a group of distinct islands in a unique corner of Britain encompassing 5 islands, 2 cultures and 1 unforgettable holiday! Or explore Old Normandy just a short way across the Channel by ferry, Normandy offers you its own special version of France, with unique cuisine, verdant landscapes, historical towns and an assurance of a warm welcome.